ARB Maximum Performance Portable Air Compressor Designed to provide high flow air on demand, ARB's twin motor portable air compressor is the ideal solution for air tools, tyre and camping or leisure gear. It's twin motors are internally thermal protected against extreme temperature damage while a heavy duty in-line maxi fuse for each motor provides professional circuit protection. 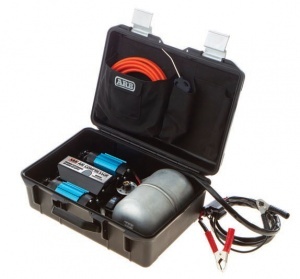 The compressor comes in a high quality carry case featuring internal pockets for components and accessories including a 6 metre air hose.